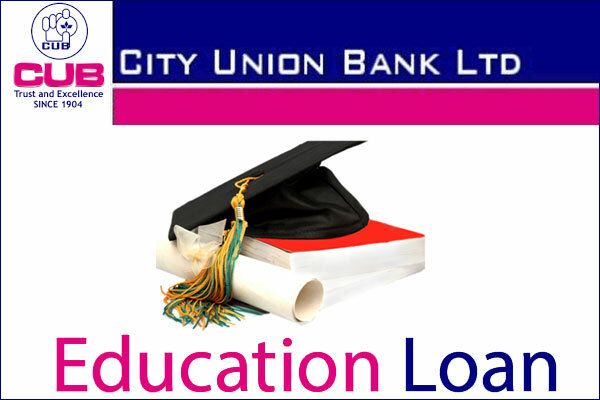 City Union Bank Education Loan Scheme - CUB Vidyavani, aims to provide financial support to deserving/meritorious students for pursuing higher education in India and abroad. The Scheme also aims to provide financial assistance to the needy poor to undertake basic education. For payment of Examination/ Library/ Laboratory Fees. For making Travel Expenses/Passage Money for studies - abroad. For purchasing inputs essential for completion of the course. Any other expense required to complete the course like study tours, project work, theses, etc. Rs.20.00 Lakhs for studying abroad. Based on the demand received from the college / Institutions, keeping the required margin. The disbursement towards fees etc to college / purchase of equipments should be direct to the College / Institution / supplier. - Scholarship/Assistantship to be included in Margin. - Margin may be brought in on a year to year basis as and when disbursements are made on a pro-rata basis. 1. Third party guarantee and immovable security equal to 100% of the loan amount. 3. The document should be executed by both the student / and the parent / guardian. 4. The security can be in the form of land / building / Govt. securities / Public Sector Bonds / NSCs / KVPs / LIC Policies, Gold, shares / MF units / debentures, bank deposits in the name of the student/parent/guardian or any other third party. If land/bldg is already mortgaged, the unencumbered portion can be taken as security on second charge basis, provided it covers the loan amount. 6. In case the loan is given for purchase of computers, the same is to be hypothecated to the bank. The bank can also issue the Capability Certificate for students going abroad for higher studies after obtaining the relevant supporting documents from the applicant. The student/parents have the option to repay the interest during the holiday period. If the student / parent do not opt for the same, the principal o/s together with interest payable should be clubbed and should be repaid in EMIs. The loan to be repaid in 5 – 7 years after commencement. Holiday Period: Course period + 1 year (or) 6 months after getting job whichever is earlier. In case student/parents approach for educational loan after having completed one/two semesters/years, such loans based on future expenses can be considered, provided the student has cleared all the papers in the previous exams. - If any of the loans of the borrower/co-obligant / guarantor is in default, no loan will be entertained under this scheme till account/s become regular. 1.Life of student should be insured. 2.Life insurance policy should be assigned in favour of the bank. 3) No Due certificate need not be insisted upon as a precondition for considering educational loan. However, branches may obtain a declaration / an affidavit confirming that no loans are availed from other banks. - If the fees have already been paid to the college on account of urgency/payment before the stipulated date by borrowing from the friends/relatives/outsiders/institutions by availing loans, the bank may consider the loan under the scheme for payment of such dues provided sufficient material proof is provided for payment of such fees and also for availment of loans from friends/relatives/outsiders. In such case, the payment should be made direct to the persons from whom borrowed and receipts should be obtained and kept on record. - If the college/institution indicates arrears of fees for the previous year (not yet paid by the student) it may also be considered for finance. - If the student has paid fees for certain semester/s and seeks loan for subsequent semesters, the fees paid for earlier semester may be taken as margin and full (100%) fees may be advanced for subsequent semester/ years, provided original receipts for earlier years are provided to the bank for verification and Xerox copies thereof have to be obtained for our records.